The challenge for FS528 - is the amazing DJ Rants. I found this stunning Card. I turned the layout and made it girly with the bold blue layer, Added a ribbon rather than twine and used sequins rather than brads. 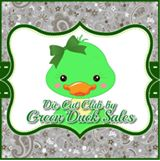 I finished the card off with this fun Green Duck embellishment rather than a stamped image and popped the layers up on dimensionals. Like the blue background with the girl's blue dress and hair bow. Very cute.